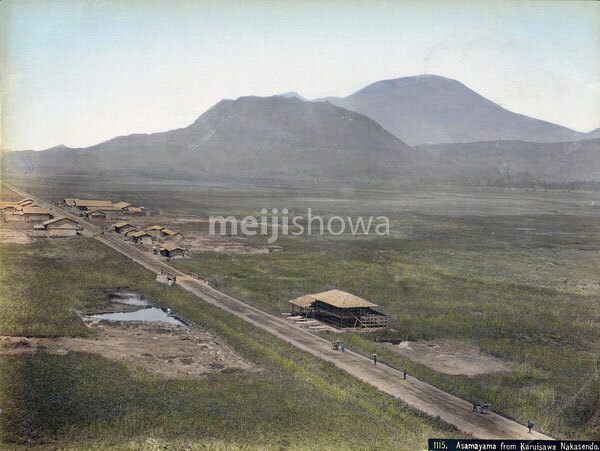 Panoramic view on Karuizawa and the national highway (now National Route 18) connecting Shin-Karuizawa to Kutsukake (current Naka-Karuizawa ), of which the first part was completed in 1883 (Meiji 16). At the back two volcanoes are visible: Mt. Hanare (front) and Mt. Asama. Around this time, the area is still largely being used for agriculture. From 1883 (Meiji 16) a businessmen by the name of Keijiro Amenomiya (雨宮敬次郎) starting planting a huge number of Japanese larch trees (葉松) here, which transformed the area into the thick forest it is now known for. In 1893 (Meiji 26), the Shinetsu railroad line was opened along this road.